This runs alongside our pre-school and is aimed at puppies who are able to be carried out and about, and have had their first vaccination but not necessarily their second jab. 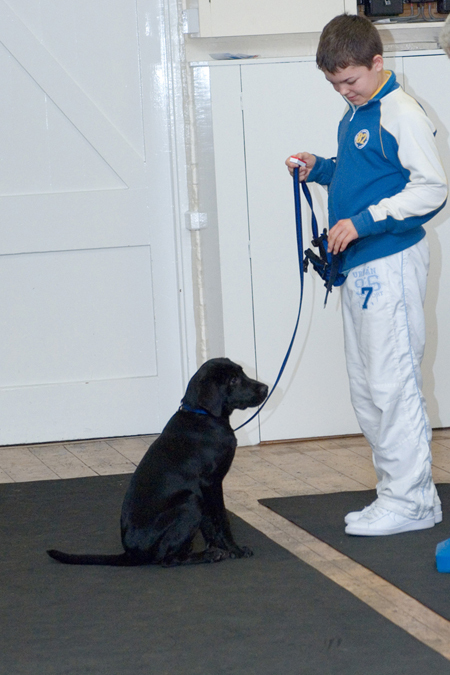 This enables your dog to be carefully socialised with the outside world, allows you to watch and listen to what goes on in the pre-school class and gives you access to one of our trainers who will be able to answer any questions you may have. You can sit with your puppy on your lap and listen and watch the rest of the class and then go home and practise so no time is wasted. All pups must be carried in and out to the class. This is a 8 week rolling term which you can join once your puppy is ready (space permitting). Any puppies who have joined the puppy crèche (see above) are given priority places in this group. These classes are suitable for any dog up to the age of approx 6m – both classes teach similar content but one is a Monday night and the other is Wednesday afternoon. The puppy class is 45 minutes long and the young dog class is 1 hour long. The first 15 minutes are for puppy socialisation (carefully supervised) and the remainder of the class is focused on specific learning and dealing with common issues. Our course aims to cover the content of the APDT Good Companion Awards (see www.apdt.co.uk) to ensure your puppy is as well prepared for the big, wide world as possible.